It all started about April 2008 when the company was looking to setup a brand new branch office. This was for about 120 people and my first design brief was “Can we do anything interesting with virtual desktops?” At that point I had only been with the company 6 months and my virtualisation experience consisted of a MS Virtual PC machine I used to test SMS packages. I did a quick search on virtual desktops and came across VMware’s VDI 2.5 solution. I was able to setup a small test lab using a couple of desktops and an old server running a virtual iSCSI san appliance. Up to that point the company had run entirely traditional desktops and server environments with local storage. Having proven that it was possible, the first design was a bit of a stab in the dark as far as requirements were concerned. I was able to get the company to send me on the VI 3.5 Fast Track course, which was really well done with a great trainer and great facilities to do the exercises on. This really helped with improving the desktop design and migrating our datacentre over to virtualisation. It was after I took the VCP 3 that I read about the VCDX certification. I made the decision then that I wanted to work towards that goal although I knew it would take some time. I attended the vSphere 4 Design Workshop course to get a better understanding of the method that should be used to design infrastructures. At that point with the newly released VCAP certificates being made available I really began working towards the VCDX goal I had set. I took the VCAP-DCD first as the design course was still fairly fresh in my mind and the DCA was the exam I was dreading the most (and still do). Once I had both of these under my belt it was really down to finding the ideal design to use for the VCDX itself, which took a little while. The whole journey took about 4 years, although in reality it was probably only the last two years that I was able to think of it as a possibility. I had read the blueprints for both the VCDX 3 and 4 and realised that I wasn’t going to be ready for 3 and needed a lot more practical experience for 4. I had got the pre-requisite certifications for VCDX 4 done by the end of 2011 and then it was down to choosing the right design to submit. This was the bit that took a bit of time as I wanted the submission to be as real a design as possible. Although a wholly fictitious design is possible, it is easier to defend decisions based on real requirements and constraints. Finally in August 2012 I had a design I felt was a good candidate with a few minor changes to cover the requirements in the blueprint. I spent about 3 weeks solidly working on completing the design documents to fit the requirements. I spent a lot of time reading the blogs of existing VCDX holders and the tips on the VMware site, trying to put all that advice into practice. I submitted and defended the design at Barcelona in October 2012 and happily, along with seven others, received confirmation I had achieved VCDX about two weeks later. Firstly go for it. The whole process is worth it. Lots of research. Read the experiences of others who have already been through the process, there is a wealth of advice out there. Also read the advice tips given on the VMware site, especially the tips on what not to do. Read the blueprint. Read it again and then again. Make certain your design covers the objectives, adding to your original design if necessary. Plan your time and then possibly double it to allow for unforeseen problems. Peer review. Get as many people to read through your documents as possible and I would say get a mix of technical experts and non technical people. Can someone with little or no experience understand your design and see why they would implement your design? You may be asking them to make a big investment. Run some mock defences. Again I would say try to include someone who is not technical on the panel. A non technical person may well ask you to explain something that a technical person will take for granted. Try and keep to the real time limits so you get a feeling for how quickly it passes. Remember you have to defend all aspects of the design so, for example, why did you do X? Could you have done Y differently? Print your documents out and proof read them, both by yourself and someone else. Get yourself a red pen and be ruthless. Finally, if you have the opportunity, attend a VCDX boot camp. I attended the one in Barcelona two days before my defence and I can say it made a huge difference on the day. Not much, knowing my own personality. I should have started the design submission documentation earlier and made time for a mock defence or two. The company, I think, is a little unsure of what it all means but my colleagues were certainly impressed. I am encouraging our other VCPs to begin the journey themselves and put the lessons I have learned into greater practice. Was it worth it? Categorically yes. The process was, for me, more a personal goal rather than something I felt was professionally required. Had I not been successful at Barcelona then I would definitely have been back for another try. Categories: Certifications, VCDX, Virtualisation | Tags: VCAP, VCDX, VCDX4, Virtualisation, virtualization, VMware | Permalink. Around 5/6 years ago the company that I was working for at the time installed ESX 3.0 to use as part of their Dev/Test environment. The “VMware stuff” as we knew it then, was installed by a contractor as our team didn’t really know too much about it. Once the installation was complete, the contractor left and we were left to fend for ourselves. I nominated myself to look after the “VMware stuff”, and that’s how this love affair began. It’s hard to put my finger on one thing. I think working closely with Frank Denneman during my time at VMware Professional Services certain contributed to me wanting to aim high. I also like to make goals for myself and I made the VCDX one of those goals. However I didn’t put a time frame on it. I could have probably defended a lot earlier than I did, but I was never really completely ready for it until 2012. It’s hard to say as I guess it includes VCP, VCAP exams as well. A lot of these exams I just took as and when I had time to take them, so there wasn’t a sense of, if I take the VCAP’s by this date, I can then submit for the VCDX. It just happened really. I had both VCAP’s, then one day I decided I was going to go for it. Don’t be scared. A lot of people who talk about going for VCDX are reluctant because they have heard “It’s really scary and the panellists are after your blood” etc, but this really is not the truth. The panellists actually want you to pass. Pick a design you have architected yourself, and that covers most of the areas of the Blueprint. If you use a design that is not completely yours, you may find it hard when asked question on those sections. Know that design inside out (read every word). Know why you chose each feature, understand what each feature you chose does and understand why you didn’t choose the other features. The technology is not the only focus in the VCDX. Make sure you fully understand and have documented; Risks, Constraints etc that affected your design. And don’t be afraid to say you don’t know to something. The guys who are asking questions will know if you’re making it up or not. Nothing. It went pretty smooth I thought. My Company were pleased for me. No pay rise as yet….. 😉 But I think this is normal in the majority of companies. I think it was worth it. It certainly improved me as an architect. I now have great attention to detail (when needed). This has come from the scrutinizing of my design over a period of months. And if, in the future I decide to leave VMware, having VCDX #105 on my CV might improve my chances of securing another role. Categories: Certifications, VCDX | Tags: VCAP, VCDX, VCDX4, Virtualisation, virtualization, VMware | Permalink. I started with VMware workstation as a way to test application builds and work with other operating systems simultaneously. This later branched into using VI3 to experiment with the idea of splitting up servers at small businesses into single-role virtual machines. I eventually ended up deploying VI3 clusters to a large number of automotive dealerships throughout the Midwest using my standard design template. It was so cutting edge and exciting that I decided to shift my career focus from systems administration to virtualization administration and design. I’m a huge certification junkie which requires I turn over every stone possible to test my skills. What’s more ultimate of a test than the VCDX? I also assumed the journey would improve my skills along the way, which held 100% true. I learned a lot about doing a robust enterprise design by examining what the VCDX program desired out of a qualified candidate. I thought about the VCDX around the beginning of 2012 when I brought it up to my boss. I spent most of 2012 trying to find a good fit on a client design and improving my skill set to make passing realistic, such as completing the CCNP. Beyond that, I’ve been working on vSphere designs and writing a technical blog for years which I’m sure helped. Give myself more time to work on the VCDX deliverables. I was kind of caught off guard when I was given approval to apply for Barcelona and only had about a month to get my paperwork in order. It required a lot of late nights and all of my weekends to do it. My wife shouldered all of the copy editing work to fix my grammatical mistakes and also came up with all the graphics for my docs and presentation. This was a huge help and I would not have submitted in time without her. I’m happy to have passed, but now I’m even more motivated to help others along the way and be a mentor for the program. It was really neat to be a part of the group that broke the 100 mark and I think there are many others out there who are up to the challenge. My company was really great about it and celebrated the achievement as an organization. I credit them, along with my team, with being vital to being a VCDX and look forward to further growing with the company. I’d say it was absolutely worth all the time and effort, even if I had not passed this first time, and I am looking forward to the next big challenge. Categories: Certifications, VCDX | Tags: VCDX, VCDX4, VMware | Permalink. My first use of VMware was back in 2004 when we were investigating bare metal recoveries for Tivoli Storage Manager (TSM) and were experimenting with WinPE and GSX. I was looking for a way to standardize the recovery hardware platform for recovery as at the time there was no bare metal recovery option for TSM. It was after that then I started exploring and testing the ESX platform for server workloads and with the onset of Version 3, as the cliché goes….rest became history! An interesting question in that there are two reasons for this; the main reason was for the challenge to prove to myself that the solutions I was actively “preaching” and delivering on were on par and on the right track. The second reason was simply being at the right place at the right time as we were having a meeting with our VMware Partner Manager and our CEO was complaining about the lack of elitism within the VMware certification portfolio and then they announced the VCDX program. I was then “volunteered” to make this happen! I started this journey in September 2008 and tried to track and get as much information as possible, however being in the geo that I was, the most helpful information I got was from the active blogs run by Duncan Epping, Rick Scherer, VCDX001, and twitter tips, as exam information and details were only given out after successful registrations. The process was also impacted by the fact that I had to take all my exams in Europe or the US as there was no authorized testing centre in South Africa at that time. Therefore I had to wait for exams to open as well as align them with the major VMware events to reduce costs. This also forced me to be prepared at very short notice when I was given the availability of the exams! That said I completed my defence in February 2010 giving a total time of about 18 months. My advice is to be passionate about what you are doing and if you feel that doing the research and working out the solution interdependencies and limitations is mundane and tedious then this might not be the right track for you. Working towards the VCDX in my experience involved a lot of patience, dedication, passion and not to mention discipline as this is a method for working studiously and diligently on an everyday basis because not all solution requirements are the same. It also means investing a lot of your time over and above of your daily responsibilities and duties (work and family included); so commit for the long haul. I do not think I would change much aside from the fact that with exams now available locally it would have meant a shorter timespan to get the accreditation. Life for me has pretty much been the same since I achieved the VCDX accreditation and simply so because I chose for it to be that way as there were some tempting offers and I opted out for personal reasons. However I am now responsible for heading up a new business called VMXperts, that is a subsidiary of my former company Aptronics. (You can guess what platform this company’s focus will be). As for the response from my company everyone was simply elated and it also went well that I was the very first person in Africa to achieve this. This made their investment in the VCDX program a worthy one! The year was 2004. I was an IT Specialist working in the IBM’s Business Continuity and Resiliency Services, and became aware of customers utilizing VMware for backup and recovery of their datacetners. I went to my manager at the time and told him about this trend, and that I was interested in becoming a VMware SME for IBM BCRS. I started working with ESX 2.0 and VirtualCenter 1.0, attended VMware training, and in 2005 became a VMware Certified Professional. During this time I spearheaded the creation and rollout of IBM BCRS’s first VMware based warm-site disaster recovery offering across the US, reducing the RTO of numerous fortune 500 clients. And so began the journey towards VMware excellence! It was early 2008, and the VCDX certification was announced. The rigor of the requirements immediately attracted me to pursuing the certification. I knew this was a certification that could help further my career as an IT professional. I completed the VCDX the summer of 2009, after taking the beta exam and defending during the first publically available defense. Below was the path I took before defending. I had no idea what to expect when coming to defend, and was extremely nervous. I spent countless hours preparing, reviewing my design, making sure I knew the in’s and out, and could justify every granular detail I documented. Luckily, that was exactly the approach necessary for me to be successful. I can’t describe how happy I was when I got a phone call that I passed and was a VCDX! (yes, back then I was actually contacted by phone to be informed I passed). In becoming VCDX #15, I was the first non-VMware employee worldwide to achieve the certification (as I worked for a partner at the time). What advice would you give to people thinking of pursuing the VCDX accreditation? Dive in hear first to master your craft. Understand not just the what, but more importantly the why of architecture and design. Use the plethora of resources available to you online to become familiar with the format. Sign up for a VCDX Bootcamp to help prepare. If you could do the whole VCDX journey again what would you do differently? Nothing except more sleep the night before the defense (if you can sleep). I believe I have a unique perspective on the VCDX program, having completed the VCDX program in 2009 as the first non-VMware VCDX worldwide, and then joining VMware and participating in the ongoing development of the program as a panelist. As an outsider looking in, the VCDX program was a goal that drove me to work on my craft, and become a better architect. Since joining VMware, my participation in the VCDX program has only helped to hone my skills as a virtualization and cloud architect. It has forced me to sharpen my understanding of enterprise architecture principals, principals that aid me greatly in my day-to-day role dealing with virtualization and cloud solutions. I will be forever grateful to the VCDX program in providing a vehicle that forced me to push myself, and aiding me to take my career to another level. Categories: VCDX, Virtualisation | Tags: VCAP, VCAP5, VCDX, VCDX4, VCDX5, VCDXWannabe, VMware | Permalink. In 2003 I was working for a small software development company managing their business applications and supporting their software development team. Initially we began utilizing VMware GSX Server for those simple use cases trying to consolidate and save on our hardware spend where ever we could. In support of the software development team we also deployed ESX in a lab environment for testing and development purposes only. A fairly common introduction and use case early on in the adoption of VMware solutions. Plus, vMotion was the coolest freakin’ thing I had ever seen. It wasn’t until I re-entered the consulting field in 2007 that I really started to dive deep into the VMware products and they have been an integral part of every solution we sell and deploy. It was this exposure to the VMware technology that really allowed me to develop my abilities and deepen my experience. I also should say that a large draw for me was the large, friendly and helpful community that supported and shared knowledge around the VMware products; easily the best community with which to be associated. For me the decision was twofold, first because I’ve had the great fortune of working with one of the best consultants I know in Doug Baer, VCDX #19 and second for the shear challenge of obtaining the certification. A natural, underlying part of the equation has always been my love of the technology and interest in understanding how it works at its core. In my current line of work, utilizing the skills and knowledge measured by the VCDX certification is highly relevant and in many ways a validation of those abilities. It’s hard to say exactly when the journey started, as I had wanted to go after it for the last couple of years, but it seemed so far off and I never really got going. In May 2011, I started and then stopped my journey with a failed attempt on the required VCAP-DCA exam which in combination with a heavy load of customer commitments limited my ability to focus on it. Since I wasn’t accustomed to failing an exam, the DCA failure caught me off guard and I needed to regroup. It was then about 6 months later over the 2011 Thanksgiving (US) holiday that I had a little heart-to-heart with myself and decided regardless of the time, effort or success, I was going to go after the VCDX4 before it was updated to version 5. I was leaving too many good designs on the table which I had worked on with vSphere 4 to not try to at least defend one of them. That’s when my real, 6-month journey toward VCDX began. This involved the DCD4 exam in December, the DCA4 exam in January, the VCP5 upgrade and the DCD5 beta in February, the VCDX4 Design and application in March and then the VCDX4 Defense in May. Approximately 6-months start to finish, but ultimately the journey never ends or at least I hope it doesn’t. My advice to those interested in the VCDX would be to dedicate themselves to the investment of time and resources necessary in the effort. This may mean the setup of a home lab, the time to read product guides, the repetition of product implementation and design, and/or the review of countless blogs and knowledge base articles. But beyond having a sound technical and architectural knowledge it will also require comfort in the spotlight, an ability to present from a white board, a quickness to think on your feet, an ability to envision the big picture design, and an openness to feedback, critique and improvement. With all that said, bottom line for anyone seriously considering it, I would say go for it. You’ll never know what could have been if you don’t try. I believe many will be surprised by what they can accomplish when they focus on a goal like the VCDX. I probably would have started it earlier. Overall I felt the execution was successful once I got going, but for me it was just the issue of starting and sticking with it. Beyond that I don’t think I would have changed much. In my consulting position, the certifications are very much a part of the role and needed by the company to market, sell and deliver the solutions that we focus on. The certification definitely brought some recognition and accolades. It also provided some instant credibility amongst those in our community. For the most part, I do believe it was worth it mainly because of the challenge it provided to me and the opportunity to do what I love most which is work with the technology, understand the architecture of the products, solve the business problems of my customers, and participate in a community that is passionate about all these same things. Categories: VCDX, Virtualisation | Tags: VCAP, VCAP-DCA, VCAP-DCD, VCAP5, VCDX, VCDX4, VCDX5, Virtualisation, virtualization, VMware | Permalink. I first heard of and started using VMware Workstation in late 1999. I was a UNIX Administrator that was forced to live in a corporate Windows world. Workstation allowed me to have the best of both worlds. After thorough use and testing of the GSX and ESX products, by 2003 I was able to convince my (then employers) management that virtualization was a must for our datacenter. The rest is history. Since day one I’ve been convinced that virtualization was a huge benefit for organizations large and small. Obtaining my first VCP (VCP2 #7315) in 2006 I’ve been following the work of the education team closely. When I was invited to be a beta participant in the then newly created VCDX program I saw it as an opportunity to validate my dedication, knowledge and experience. By making a candidate jump through as many hurdles that the VCDX program has, it really shows that VMware users are dedicated to the cause. This is a great way to give VMware additional validation to the industry. From start to finish, an extremely long year, it was extremely rewarding being part of the beta program process though. Being able to assist in the shaping of the program, how the Design and Administration exams were written was really fun. Know your stuff, inside and out. 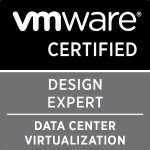 The VCDX is really a mixture of everything, knowing not only how to fully design and architect a virtualized infrastructure (not only from a VMware perspective but the associated compute, network and storage), but also how to implement that design, manage that design, upgrade that design and operate that design. Get as much hands on as possible. Learn as much as possible about how compute, network and storage relate to virtualization. Learn how applications relate to virtual machines. Know your design. That’s probably the most important thing, for your defense do not design your dream architecture, keep it simple and keep it to something you’ve done before. Know it inside and out, know what failed and how you fixed it. Don’t say you designed a specific thing to meet Best Practices, know why it’s the best practice. Also, if you’re married… get your spouse’s buy-in on the journey as well. You’re going to spend a lot of time away from them while you’re on the journey and you’ll need more support than you’ve ever needed before. I think obtaining the VCDX certification opened a lot of new doors and opportunities. Since obtaining my VCDX I’ve joined EMC as part of their vSpecialist organization, here I’m able to put my knowledge and experience directly to use as I evangelize companies about all of the amazing benefits of virtualization, application modernization, end-user computing and now cloud computing. Categories: VCDX, Virtualisation | Tags: VCDX, VCDX4, Virtualisation, virtualization, VMware | Permalink.